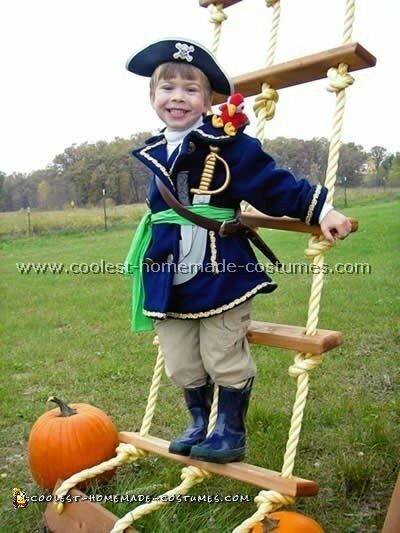 These homemade Pirate costume ideas are awesome! From epic projects to easy last-minute DIY Pirate costumes – you’ll find Pirate costume inspiration here. 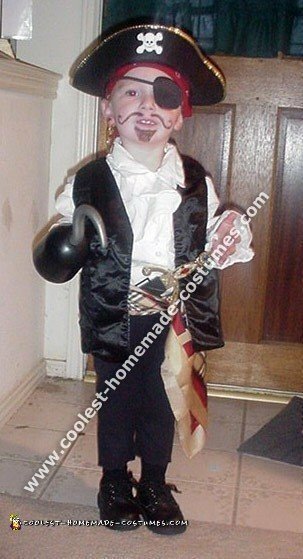 My son really loves pirates so I decided to look in this wonderful website and I got a lot of great ideas on a pirate costume. 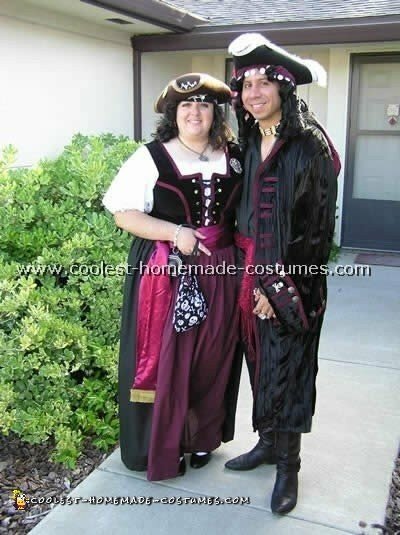 I didn’t want to spend over twenty dollars for the pirate costumes at the department stores so I went to the thrift store and came up with my own. Overall I ended up spending about six dollars. The hat, sword and hook were purchased at the dollar store. 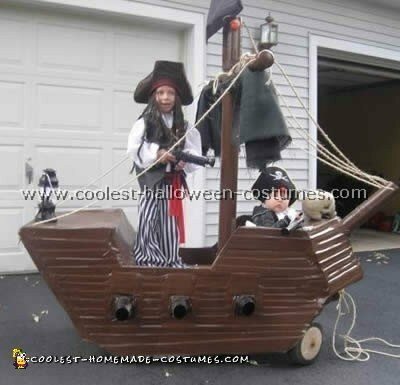 The pirate costume was built on top of a plastic wagon that we had here in the yard and has served before in costume making. I placed a piece of 3/4 inch plywood on the deck and began wrapping it with cardboard and getting the shape down, then I cut long strips for the sides to make it look like real wooden sides using duct tape over the entire thing spraying it with krylon paint. The cannons you see on the sides are made of plastic cups and painted the throw away kind and I cut off the bottoms. The mast is made of 3” PVC with 2” PVC for the cross piece. Black material I had on hand and the rope I drilled and did my best to rig the ship. The skull was a prop we had here, the flag we bought somewhere in our ventures. And the battery operated light came from online USA toys. My three year old son Jacob and my nine month old son sail into history as pirates looking for loot. 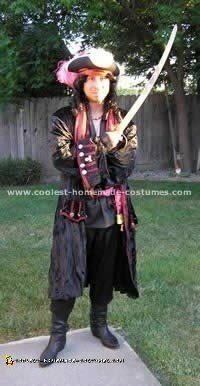 This pirate costume was inspired by a toy parrot and the fact that Halloween in Minnesota requires a warm costume! When my three year old son wanted to be a pirate with a parrot I knew the costume would have to include a coat. I prefer not to sew especially not heavy fabrics so I started by looking at resale and thrift stores for my raw materials. I found just the thing: a blue wool girl’s coat for $6.50. You probably won’t find a coat with the lines of a real 18th century men’s coat but the key is that the coat be an A-line or swing-style coat rather than a pea coat. Buy it a size or two large so you can fold up the cuffs and have plenty of fullness when you create the coattails with tucks and pins. First I replaced all the plain blue buttons with shiny gold ones. Then I tailored the too-large coat to my son tucking and pinning the loose fabric at the back of the coat in two darts right above the waist. The pins were fastened on the inside of the coat and any lumpiness was covered up later by a sash. My general idea was that men’s coats of that era fit snugly on the upper body but flared at the waist. (Think George Washington and the Founding Fathers.) You can easily skip this step if you’d rather but I felt it helped the overall look. If you sew you can do the darts properly. If you’re like me safety pins will come to your rescue. Then I used fabric glue and lots of gold braid trim to decorate the coat’s collar and lapels, the front edges, hem and the folded-back cuffs. 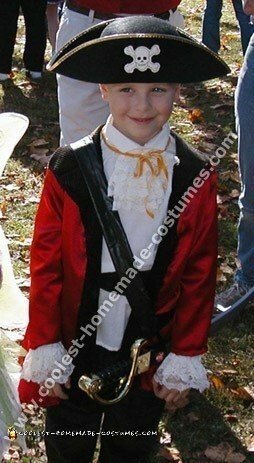 My biggest expense for this pirate costume was the braid and buttons which cost about $15. We paired the coat with a white turtleneck and tan pants tucked into dark blue rain boots. All of these items were already in my son’s closet. No pirate captain feels complete without his hat and a sword (about $7 from a local toy store) which we tucked into a bright silk sash (one of my scarves but also an easy and cheap purchase from a thrift store). I thought about making a lacy jabot to pin to the front of the turtleneck but decided against it. I thought my son might fuss with it. My son also liked the look of an old leather belt slung over one shoulder sort of like a bandolier. The finishing touch was the small stuffed parrot that I safety-pinned to the shoulder of the coat if you can pick a parrot that contrasts with the coat. Our parrot was from a toy we already owned (the Parents Magazine Animal Hospital) but I’ve seen other small beanie-baby parrots at our local thrift stores for 25 cents. Little kids have narrow shoulders so be sure the parrot is small enough to be comfortable and neither falling off the shoulder nor poking into the kid’s ear. Everyone who handed out candy on Halloween asked the parrot’s name! So we thought the pirate costume was complete, it was warm, it was colorful and it already won a prize in a local contest. But then Halloween came and it was going to be a drizzly night. Yikes! Our pirate was going to get soggy! Naturally we have umbrellas and some of them were big and black, so as evening approached I used some white fabric paint to add large skull and crossbones to a black umbrella. When trick-or-treating began our little pirate sailed forth dry and snug under the Jolly Roger umbrella. This looked so cool it might be worth the trouble even if it’s not raining on Halloween night! 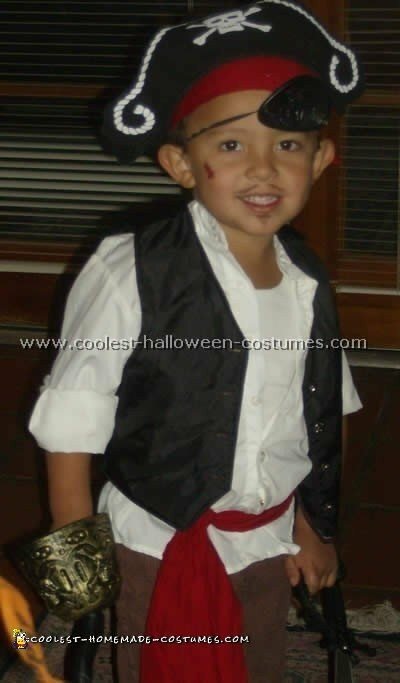 My son got lots of compliments and I still love this pirate costume. 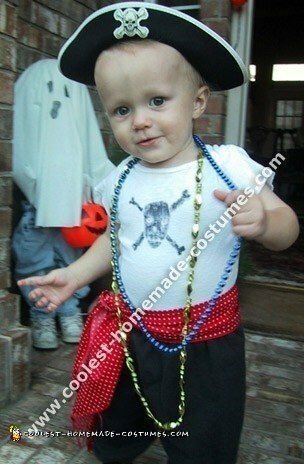 This little pirate costume was created in all of about 45 minutes to an hour! I purchased some material remnants at Wall-mart. This included some stretchy red material, lace and trim ribbons and several other things I didn’t need. I purchased an oversized white boys dress shirt for $1 at the thrift store. I also bought 4 pieces of brown felt (8″x10″ sheets) at hobby lobby for 50 cents each. My son already had the sword and black pajama bottoms and I had the black eyeliner and the leather lace for the boots. *Note: If you are craftier with hot glue than needle use hot glue instead of sewing. For the pirate costume shirt, gather the lace trim in the shape of a paper fan. Hand sew one end to hold the “fan” shape. Sew the fan shaped lace onto the side of the shirt that ends up on top after it is buttoned at the collar front and center. Do it so that there is no need to attach the lace on the other side once the shirt is buttoned. Cut two equal strips of the lace trim so that they fit on the cuffs of the shirt. Tack the lace to the sleeves. You can do as many rows of the lace as you see fit. Pirate costume shirt is done! For the boots, put four sheets of felt on top of each other cut out the shape of a boot starting at the toe curving over the foot and away from the shin to create a folded over boot top (be sure to make it big enough to fit over the shoes of whom ever is wearing it – if the sheets aren’t big enough the material isn’t much more expensive). Use an ice pick or any other sharp object to poke holes on the front of the boot and the back. Use the leather lace or any type of thick yarn/ twine to sew the back in the same fashion you would lace a tennis shoe. Do the same to the front. Make the laces long enough to wrap around the shin then fold the edges over on top. The eye patch for our pirate costume isn’t really a patch. Use real black eye make-up and it doesn’t itch so the kids will leave it alone. 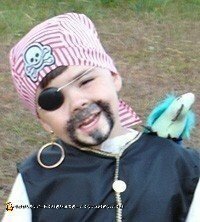 I used brown and black eyeliner to create a goatee on my son as well. Put the pirate costume shirt on. Tuck it in. Put the pants on. Slip the boot covers on. Put on your child’s shoes. Pull the covers down over the shoes. Wrap the red head band over his/her whole head and tie it in a knot on the side of your head. Put the sash on leaving a long tail on the side. Grab your sword and hit the neighborhood! If it is going to be extra cold, spend another $2 for extra Black Felt. Poke holes across the top, cut off the corners, run a long piece of leather string or twine through the holes, tie it around their necks and they have a warm pirate cape to wrap up in! Total Spent: $7- $10 depending on what you already have. We love to dress up as pirates. These costumes are 100% handmade. Each Pirate costume took me about one week to complete. We have worn them several times and always get rave reviews. Long live pirates! I love sewing costumes. My children always had homemade costumes so you can imagine my joy when my grandchildren asked me to make them costumes. My four-year-old grandson wanted a pirate costume. So the first thing I did was look at as many pirate pictures I could to get ideas. I bought a pattern for a gentleman of the court for the shirt and pants. I used the waistcoat pattern but added length to it; also a black lining and gold braid. I made pirate boots to go over his shoes with the cuffs on the top with brown vinyl. I also used the vinyl to make a belt and a purse for his gold doubloons (he carried twelve gold plastic doubloons in it so they made a noise when he walked). Then I used 1/2-yard cotton material (black with skull and crossbones on it) for his bandanna under his hat. The pirate hat, eye patch, sword and gun I purchased at the party store. Of course no self-respecting pirate would be seen without his beard and one gold hoop earring. But I think the crowning touch was of course his companion in arms, Polly Pirate the parrot on his shoulder. I wasn’t planning on taking my one year old out on Halloween, but changed my mind at the last minute. 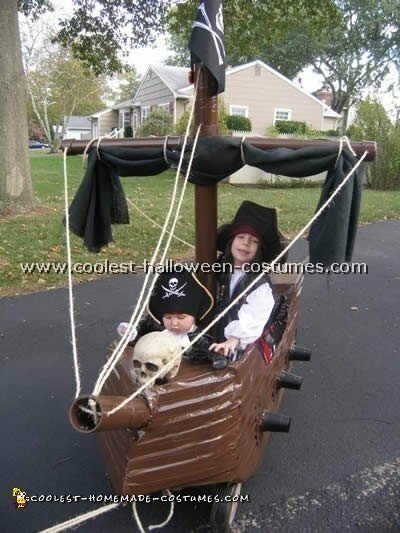 I actually put this pirate costume together 30 minutes before trick-or-treating. I used an old white onesie that I drew on with a permanent marker (a skull and cross bone design), black sweatpants, polka-dot scarf from my drawer, Mardi-Gras beads and a pirate hat from the dress-up box, and a plush parrot from the toy box (not pictured). I created this costume by starting at a thrift store. I found a little girls “puffy” shirt, a black vest and a women’s scarf. Then I went to a Halloween party store and bought a pirate hat, hook, dagger and eye patch. I already had a red bandana from a previous costume so we used that also. We used some old black knit pants and cut them off raggedy. I used eyeliner to make a moustache and beard. The finishing touch was a gold loop clip on earring. I don’t think that I spent over $10 for the entire pirate costume. He had the best time pretending to be a pirate in his costume! My 6 yr. old son wanted to be a Pirate for Halloween. We went to the fabric store and found a pirate pattern with a jacket that was close to what we wanted. I used that as the base and then sewed a layer of what was supposed to be interlacing onto the front instead of inside for the black trim. I used that same material to make the pants and a sash. He wore black sneakers. The white ruffle shirt came from a Colonial Costume my Mother-in-Law had made my Husband almost 30 yrs. 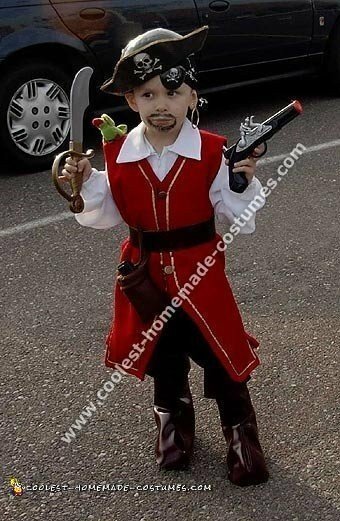 ago and it just happen to fit my son the year he wanted to be a pirate! I then used a piece of faux leather to make a holster for his sword and the hat he already had. My husband ended up dressing in a pirate costume also and I made a parrot costume for our 5-month-old daughter. It was a great Halloween and I can’t wait till he decides what he wants to be this year. My 5-year-old wanted to be a Pirate for Halloween. I looked at several patterns in books but nothing jumped out at me. So I used an old pattern from last year’s indian costume. I got the fabric for the pirate costume from Walmart, all out of the $1 yd bin. Then I used red and white stripes for the pants, white for his shirt, black for the vest and blue for his tie on belt. I added gold coin trim to the belt and I also used the extra coins for his buttons. I cut his sleeves in Zig-Zags as well as his pants leg. And of course no pirate costume is complete without a side kick parrot. I couldn’t find a parrot anywhere, so I made one out of scraps from my last years costumes (Peter Pan and the indian). Then I went on the internet and printed out pictures of the side view of parrots and used them for the pattern. I used the green material from last years Peter Pan for the body and the feathers that were left over from the Indian costume. He went bare foot in his pirate costume because it was about 80 degrees here in GA on Halloween. 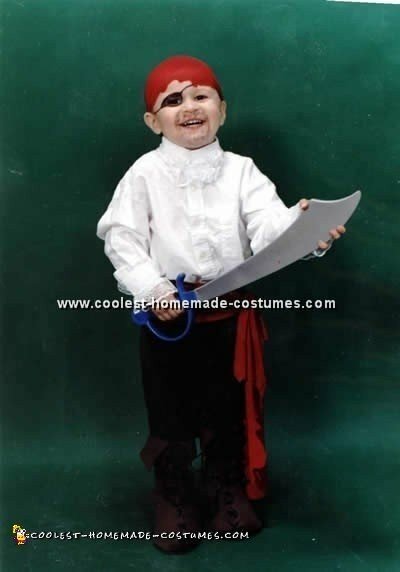 The day before he had seen the movie Goonies on TV and on Halloween he told everyone he was the pirate One-Eyed Willie.